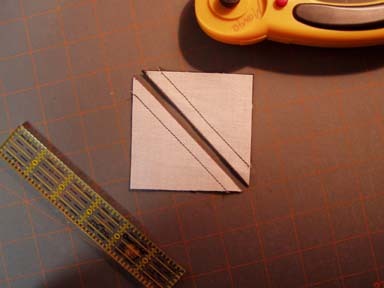 If you just need one diagonal half square, you can cut triangles from your fabric and sew them together. 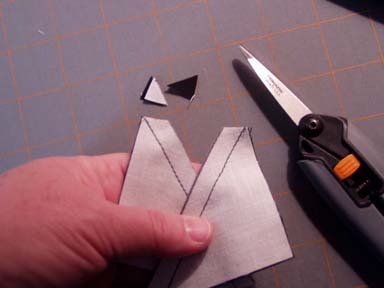 The disadvantage to that is that you are working with bias edges, the stretchiest part of the fabric. If you stretch the diagonal cut as you sew, you may not get a nice smooth square. 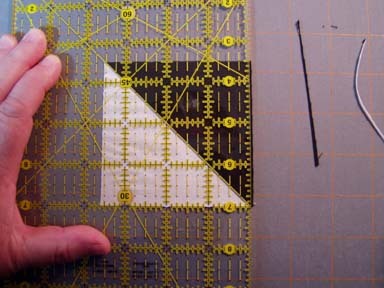 Now if you need just two diagonal half squares the same, you can use one of these methods. 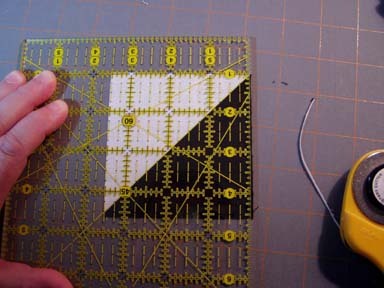 Now if you have a true 1/4 inch foot on your machine, you can sew on either side of this drawn line. 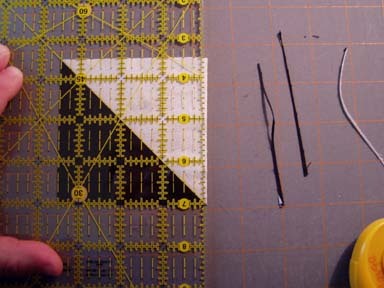 If you do not have a true 1/4 inch foot on your machine, you will have to draw a second line on either side, exactly 1/4 inch from the first line. 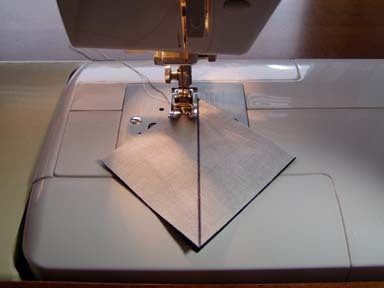 This will be your sewing line. Don't use red magic marker like I did, this is just so you can see my lines. When I am doing this for "real" I use a #2 pencil. My favorite marking tool is a Papermate Sharpwriter. 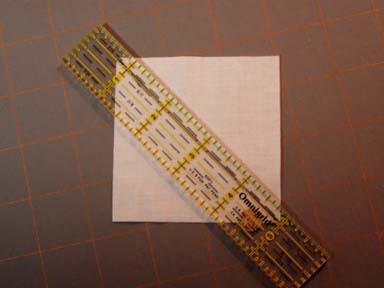 After you have sewn on your sewing line, 1/4 inch on either side of your corner to corner to line, you will cut this square in half on your cutting line. Be sure to trim off the dog ears. Press to the darker half. You will now have two diagonal half-squares. 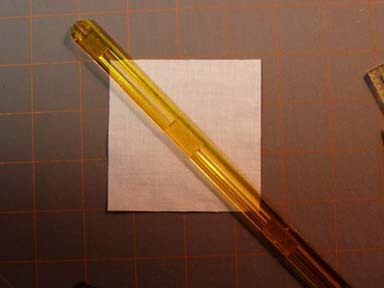 diagonal half squares should measure exactly 4 1/2 inches. center slit with is your center diagonal line. You do not have to mark the center line. 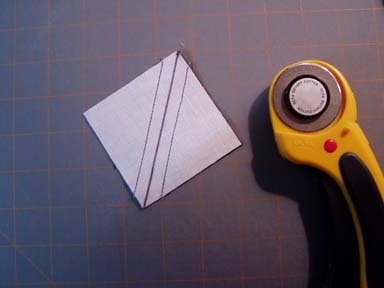 Mark instead the edges of the quick quarter, which are a true 1/4 inch from the center line. 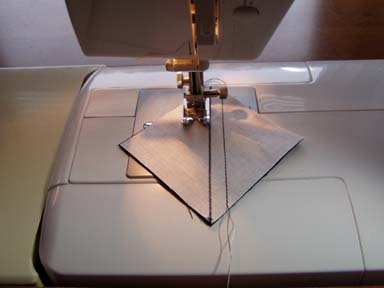 This is your sewing line. 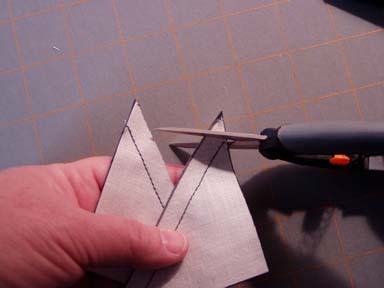 Rather than cutting a something and 7/8 inch square, which some people have trouble doing, cut a full inch square (1/8 inch larger than needed). 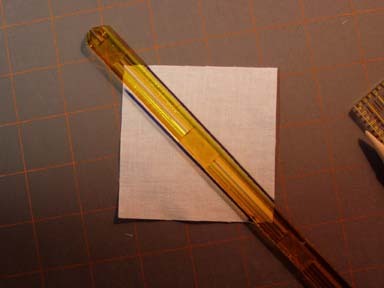 Use either method A or B to mark and sew, and then cut them. 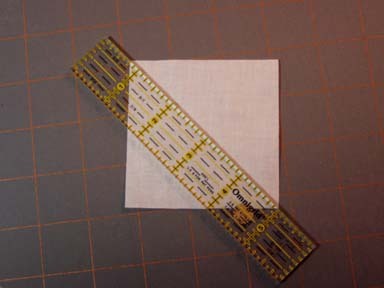 In my sample here I need a 3 1/2 inch diagonal half square. Instead of cutting 3 7/8 inch squares, I started with 4 inch squares. 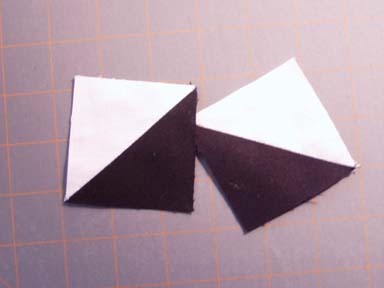 I used my quick quarter to mark it, sewed it, trimmed the dog ears and then pressed. 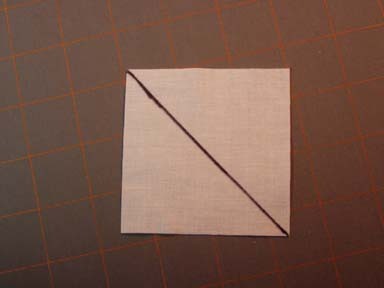 However, I do not have the perfect 3 1/2 inch diagonal half square I need, but one which must be trimmed back. 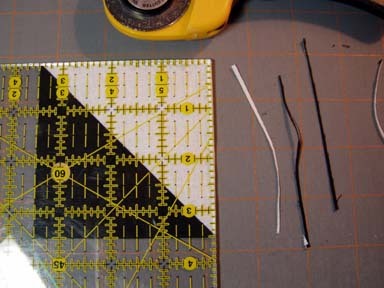 I will carefully trim this larger square back to the size I need. 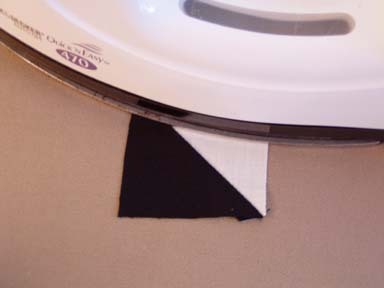 I will not trim just one side, but trim carefully on all four sides. 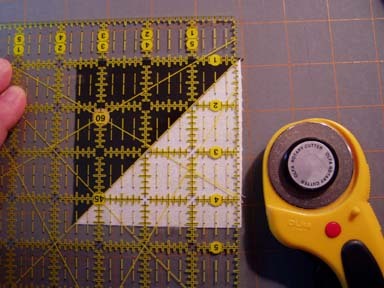 Lesson Three - making LOTS of the same Diagonal Half Squares.